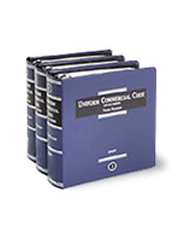 This complete collection of Uniform Commercial Code (UCC) forms covers Articles 1 through 9 and includes detailed expert analysis and discussion. Includes the official code text with expert analysis and commentary; checklists, including allegations that must be included or are permissible in the pleadings in different jurisdictions; trial aids to assist in planning strategy; statutory and text references; and a step-by-step chronological procedural timetable. Includes sales; leases; negotiable instruments; bank deposits and collections; funds transfers; letters of credit; bulk sales; warehouse receipts, bills of lading, and other documents of title; investment securities; secured transactions; sales of accounts; contract rights; chattel paper; and more.